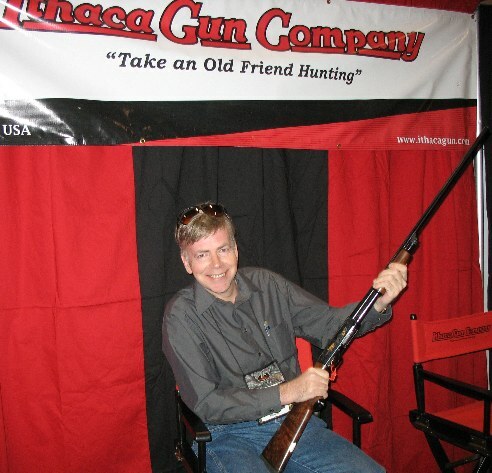 The Ithaca booth at the 2009 SHOT Show in Orlando was exceedingly busy; it sure looked like they had a great show to me. The interest in the new Ithaca's was at an all-time high. Ithaca has a just-completed prototype of their new made in the USA O/U on hand, the great looking 12 and 20 gauge models they have been shipping, and they also introduced the first-ever in history Model 37 in 28 gauge. 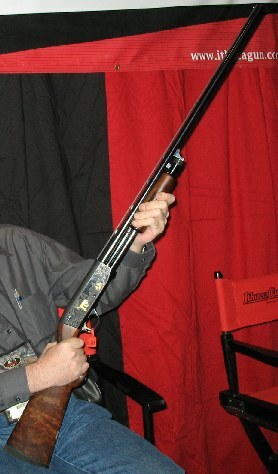 The Ithaca Model 37 28 gauge is a head-turner, designed on a new all-28 gauge frame, available (for starters, anyway) on a custom order basis with shipments commencing in March, 2009. As a custom order gun, you can get what you want as far as wood grade and engraving type. 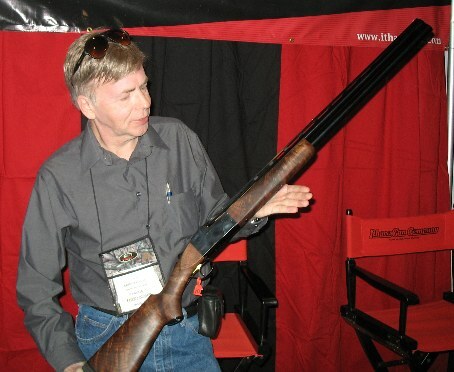 The standard cut-engraving patterns are done in house, with the hand full-coverage engraving options offered both in a subdued version (my favorite) or with gold-inlays as shown with the 28 gauge I'm holding. It is a stunningly great looking gun, and just screams "fun" to me. All the Ithaca's I examined had superb triggers, very slick actions, and looked just fabulous. It was once of the most confidence-inspiring, sweet-swinging 28 gauges I've shouldered in years. It seems like everyone wants a new Ithaca this year, now that they've finally got it right. In addition to keeping up with all the 12 and 20 gauge 37 orders in both steel and Ultralight, their Deerslayer models, the 28 gauges are scheduled to start shipping in March-- not very long away. The new Ithaca O/U is soon to follow, with the new Model 37 in 16 gauge to follow later this year, and a brand-new Ithaca Side-by-Side following towards the end of the year as well. For now, though, the new 28 gauge turned a lot of heads (including mine) and will likely keep Ithaca busy for a long, long while. I can't imagine who wouldn't love to have one. Expect a full, detailed, critical review of this all-new, first ever 28 gauge in the near future. It promises to be a real winner; a gun for the ages. Contact http://www.ithacagun.com to get yours.